The price doesn't include the cost of the figures. I offer a painting service to a collectors standard only. I only accept small orders of up to 40 figures per order (approx), repeat orders may be possible depending on work load. I research uniform details very thoroughly before starting any painting ,and have collected a comprehensive library of uniform literature along with a vast array of History books covering most periods. I use acrylic paint made by wargames foundry, Vallejo, and games workshop. All figures are first undercoated white and finished with a matt varnish. I also build and paint small vignettes and dioramas to order. These can look great and create a focal point for any game. Prices will vary depending on number of figures. I don't specialise in any one period or scale and will paint figures from any range that's 15mm or larger. I charge for each piece. Foot and cannon are one piece, mounted count as two pieces. The prices below are per piece, however some figures that are over scaled, super detailed/Caricatures or Generals/Heroes that will take longer to paint will cost a little more. All postage is charged at actual cost whenever possible. As a guide the following prices will give you an idea of how much post and packaging will cost. Minimum post and packaging = £4.001st class recorded. Order value up to £50 = £4.00 1st class recorded, price depends on the weight of the parcel. Order value up to £100 = £5.00 1st class recorded. price depends on the weight of the parcel. Large orders will be sent at current post office prices. price depends on the weight of the parcel. Payments can be made by Paypal and will need to have been made in full before any figures are shipped. The Figures represent Thomas Lord Roos. Not the greatest of commanders as he was captured and beheaded. 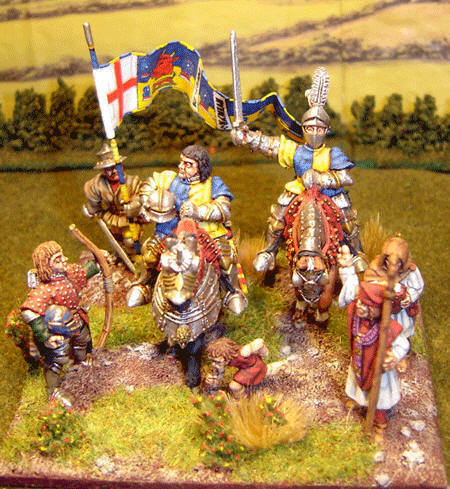 The retinue had livery colours of blue over yellow.